John O’Sullivan reflects on the potentially serious impact rescheduled fixtures have on League of Ireland clubs. 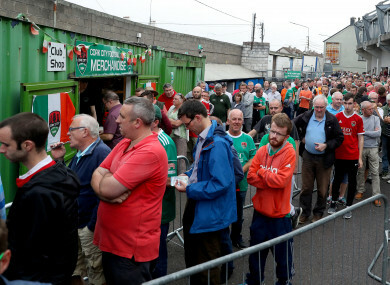 Cork City supporters queue for tickets outside Turners Cross. CASH IS KING. Whether you’re a League of Ireland club or – it seems – a national association. A club may be on track for a massive year-end profit, but if cashflow means players and staff – or buses – aren’t paid in March, then an expected windfall in May is little use. A club might never recover from the negativity. These days since the introduction of licensing, League of Ireland clubs are more aware of, and typically better at controlling, their budgets. Premier Division clubs return monthly management accounts to the FAI, which at least prompts a periodic review by the clubs themselves. Most clubs budget well across a financial year and when the last ball is kicked at season’s end, the majority break even. However, unknowns can occur within the season affecting cashflow and your ability to pay bills the following week, even when you know a big payday is coming. Cashflow has been on my mind this week. Due to international call-ups, four clubs have had home fixtures unexpectedly postponed. Dundalk, UCD, Sligo Rovers and St Pat’s all have budget gaps this weekend. Gate receipts provide a significant portion of any League of Ireland club’s income, so a loss of a fixture on short notice can have a serious effect. A club might never get all the money back, especially when the rescheduled fixture is likely to be played midweek before a reduced attendance. A ticket price of €5 for concession and €15 for an adult means the weighted average ticket sells for around €11 at most LOI clubs. A 3,000 attendance lost means €33,000 is wiped off the planned income for that week. Considering the early-season momentum of the clubs involved, the games in Dundalk and Inchicore tonight should have been close to sell-outs. On a Monday or Tuesday further into the season, they might not get close to it. Wages and bills still have to be paid. You might not have cash reserves in the bank and may have to secure a short-term loan against future income or dip into an overdraft. It is why the fixture schedule is of such importance when clubs are budgeting and why changes to it have such an impact. While I was on the board of Cork City, we once went seven weeks with just a single home game. It was against Mervue United on a Thursday (due to a Carling Nations Cup game on the Friday night at the Aviva) and at 6.00pm (due to an issue with floodlights). A number of the board showed up that night with our own money to cover wages in case the crowd was low. We couldn’t risk unpaid wages or bills so early into supporter ownership; the negative press would have put paid to all the hard work. While we were prudent and ended the year in profit, on that particular night we weren’t sure we could pay wages. The FAI statements reveal that a cashflow issue was the reason behind the €100,000 loan they received which has been so prominent in this week’s headlines. It is a worry as a League of Ireland supporter that the national association appeared so exposed to such a small amount relative to an organisation of their size. It’s only three times the cashflow gap I mention above that LOI clubs may have to address this weekend due to postponed games. To place it in perspective, €100,000 is the equivalent of 2,222 people deciding not to attend next week’s Georgia international at the Aviva because of the weather, ticket price of €45, or the fact it’s a Tuesday night. That the association can find themselves making headlines over an attendance swing of about 5% of the stadium capacity is worrying for LOI clubs. Here’s why: LOI clubs budget according to expected income at committed times, including Uefa prize money and solidarity payments which are distributed through national associations. They don’t hold huge reserves of cash to compensate for fixture changes or the rainy day, and they need to be able to rely on the stability of expected funds arriving on time. If the FAI have budgeted for 40,000 people in the Aviva next Tuesday and 2,222 fewer attend, that’s a €100,000 cashflow gap. It might not cause an issue and it should not cause an issue, but the FAI have to open their books in a detailed and transparent way to those who are dependent upon them and to those with whom they want to partner on running the league. For the hundreds of people employed in the League of Ireland, never mind the FAI’s own direct employees and contractors, uncertainty isn’t good enough. Email “'The FAI have to open their books in a detailed and transparent way to those who are dependent upon them'”. Feedback on “'The FAI have to open their books in a detailed and transparent way to those who are dependent upon them'”.